"Gotta get some whiskey. If I don't get whiskey soon, I'm gonna DIE!" In the early 1990s, the praise heaped on movies like Dances With Wolves and Unforgiven talked all about the renaissance of the Western, a genre that fell on hard times there for a while. Well, for something to have a renaissance, a rebirth, it has to die first. And with this movie we have a fairly good instance of the Western giving off a death rattle, a pretty tired and lazy version of the American mythology—goodness knows we're a long way from Stagecoach, or even the revisionist Westerns of Sam Peckinpah from the 1960s. The Mountain Men pretty much boils down to a couple of old codgers chewing the scenery, wearing beaver hats, and prefacing most of their pronouncements with the words "Looky here." The title characters are played by Charlton Heston and Brian Keith, who as Bill Tyler and Henry Frapp are just about interchangeable, but for the fact that the latter has a fouler mouth. They're beaver trappers at a time when the beaver pelt market is going to hell in a handbasket, as silk is all the rage, driving down the price of their goods. This is a movie in which every entrance of a Native American character is preceded by a whooping cry of: "Injuns!" And there are good ones and bad ones—the Crows are with the white men, the Blackfeet are agin 'em, and Tyler and Henry more than once get caught in the crossfire between the two tribes, who hate each other. The Blackfeet are portrayed as crazed, bloodthirsty savages, eager to scalp the white man, and so it's trouble when, in battle, Tyler inadvertently saves the life of Running Moon (Victoria Racimo), a Blackfoot sold into marriage to the hateful Heavy Eagle (Stephen Macht). Henry disappears, conveniently, long enough for Tyler and Running Moon to have a proper courtship over meals of roasted moose meat. (This is not a movie to look to for dating tips.) Heavy Eagle wants his woman back, however, and is prepared to kill Tyler to get her. As you might surmise, the portrayal of the Native Americans isn't an especially flattering one, and while I don't want to be any sort of politically correct policeperson, it's hard not to wince at the depictions of these smoke-'em-peace-pipe "Injuns." There is some fine scenery here, and a couple of startling images, such as Tyler waging battle with some wolves over a precious buffalo carcass—it's downright Darwinian, especially in the ravages of a Rocky Mountain winter. 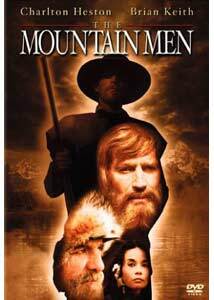 But mostly it's hard to figure that this was made in 1980, the year of movies like Raging Bull and Ordinary People; completely lacking in nuance, The Mountain Men seems strangely retro, a product almost of a previous generation. Part of that is the two leading men, both of whom are hamstrung by absurd cosmetic facial hair. Heston is fairly stalwart as Tyler, though his natural woodenness makes the love story rather stilted; and when Keith is on screen, it's almost another movie, one about a couple of old rapscallions rather than a tepid tale of interracial prairie romance. (Neither of those narrative strains is especially galvanizing, but I admit to taking a certain pleasure in hearing Uncle Bill from Family Affair cursing a blue streak.) Keith and Heston seem to be having a fair enough time, but there's only so much you can do when the best lines read like this: "Henry, you ain't got the brains God gave geese." Racimo does her best in a thankless part as the noble savage, the woman fought over so fiercely. John Glover has a pretty fair, brief turn early on as a Massachusetts man intent on starting cross-continental commerce, to the guffaws of the mountain men; he just ups and disappears after thirty minutes, to the film's detriment. Also in the cast is Seymour Cassel as a foul-mouthed Frenchman on the frontier, sporting an absurd, Pepe Le Pew accent. Image Transfer Review: The original widescreen image is pretty well savaged in this pan-and-scan-only release. Wide shots with three characters�and there are a number of them�suffer the worst, with one of the actors being just lopped right off of the image. Insult to injury: the print is in poor shape, and doesn't seem to have been improved much for DVD. Grain, grain go away�lots of it here, along with scratches, debris and badly faded colors. Audio Transfer Review: The balance between the soundtrack and dialogue is seriously out of whack, with the obvious score cranked up to the point where it frequently overwhelms the action. Other than those unfortunate moments, the dialogue tracks are reasonably clear. Extras Review: Columbia's typically healthy menu of subtitles and trailers for two more recent Westerns are the only extras on the disc. A slapdash video presentation doesn't help to make a persuasive case for this movie, which isn't a stellar bit of filmmaking to begin with. See it if you're desperately in need of a Rocky Mountain high; otherwise, you'll find better Westerns and better work from Heston elsewhere.